How do you depict something as global and catastrophic as an apocalypse on a minute budget? It's a daunting task to say the least, and it's one that Trey Edward Shults' It Comes At Night manages pretty well. There are no sweeping city shots to reinforce a worldwide event here, in fact Shults' film is confined almost entirely to a single household. It's a chamber piece that takes on something huge, and, even if the results don't quite come together in the film's risky final act, the journey there is harrowing enough make things work. Essentially, some form of contagious disease has spread around the world. Paul and Sarah (Joel Edgerton and Carmen Ejogo) live with their teenage son Travis (Kelvin Harrison Jr.) in a remote house in the woods, isolated from any form of society that may be left. One day, a survivor called Will (Christopher Abbott) accidentally breaks into their home, soon revealing that he has a struggling family living nearby. The two families unite in the household and agree to work together in ensuring their survival, but a ravaged outside world threatens to break its way into the mindsets of all left standing as the boundaries of trust and loyalty begin to collapse. It's a terrific premise - one with echoes of the superb 10 Cloverfield Lane from just last year - and it's mostly executed brilliantly. In terms of direction, Shults delivers the goods and then some. The house is eerily shot, flickering back and forth between a homely environment and something infinitely more sinister - we can relate to it as a place of sanctuary and a place of fear almost simultaneously. There's a genuine sense of isolation, too. The outside is rarely shot in the daytime, and any potential horizon line is masked by the ominous forest - both geographically and psychologically, everyone here feels well and truly lost. This brilliant atmospheric work helps to form a sense of unrelenting tension from the first frame right through to the last. 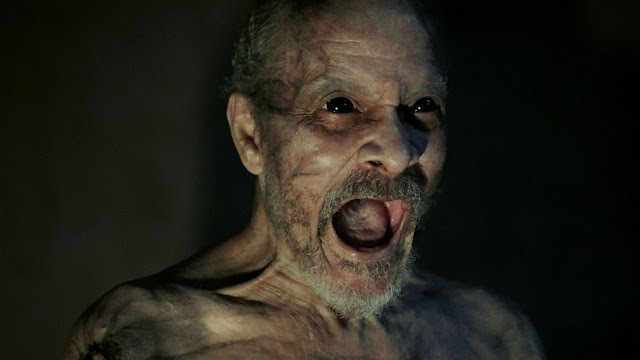 It Comes At Night is a slow film, but it's paced effectively - the tension escalates with every passing minute, all building to a climactic moment as inevitable as it is shocking. Whether or not it earns this gut-wrenching blow is up for debate, and we'll come to that later, but the impact certainly isn't lost in the moment. The film relishes in character based tension, dialogue pieces that cause friction and snowball into harsher consequences. In one of It Comes At Night's best moments, Will unintentionally contradicts a previously told story, spontaneously destroying any hope of a peaceful harmony - it's a simple mistake that should have the impact of a slap on the wrist, yet it lands like a death sentence. Shults' cast don't have an easy job here, a lot of the burden for depicting this ever growing tension falls on their shoulders, but all six of the film's adult performers deliver. Edgerton takes on the trickiest character by a comfortable margin, and he sells Paul's slow descent into a kind of insanity incredibly well. As Paul's faith in humanity is slowly torn away from him, we feel as if we watch his soul leave his body with each passing scene. Edgerton combines his line delivery with his physical acting exceptionally here, it's a standout performance in a film that so desperately needed one. Ultimately, It Comes At Night doesn't stick the landing - at least, not for me. After a slow burn narrative, I want answers. I need a resolution. I'll refrain from saying too much as to the film's conclusion, but I'll warn this - if you're the type of person who wants everything wrapped up neatly in the final act, It Comes At Night is very much not for you. Admittedly, there's one small moment in the film that never gets explained, and it's brilliant - it's an answer we didn't need, and one that'll likely be one of the biggest causes for debate when you discuss the film post-viewing. However, there's also another answer we don't receive, and it's a much more important one. The whole final act essentially hinges on a plot point that never gets resolved, leading to something shockingly dark but frustratingly unearned. It Comes At Night does one of two things: it either verbally tells us its own conclusion very early on, or it takes an already dark depiction of humanity and forces it even further below the light. That it doesn't tell you which it's doing should be thrilling, but it feels forced. Perhaps It Comes At Night's heavy handed ambiguity is to reflect the lack of answers its characters have as to their own situation - after all, why should we, the humble viewer, be given any right they don't have? That feels flimsy though, it's never properly explored within the script nor is it in keeping with the film's general tone and style. When I first left the cinema after seeing It Comes At Night, I was entirely muddled as to whether I loved or hated what I'd just seen. I've come to a conclusion now - I love what the film does, but I hate how it ends up doing it. Ambiguity is terrific - trust me, Personal Shopper is one of my favourite films this year - but it ultimately doesn't fit in with It Comes At Night, making for a disappointing endgame. Thank God those first 75 minutes are exquisite. Tense, creeping and effectively atmospheric, It Comes At Night is a focused and solidly crafted psychological horror even if it struggles to justify its own uneven ambiguity.